We all need our equipment and tool to last longer and work efficiently. To ensure their working, there are some measures and tips that you should. Pressure washers are some high maintenance units, and you need to take care so that they can last longer. There are some tips which can help you in maintaining them, with minimal efforts. The results can be amazing by just putting the right amount of efforts. Let’s us look at the tips and how you can use them. Always Lube you washer: you can buy antifreeze or lube cans from any hardware shop, and use them. Just attach the can to the inlet, and runs it, till the water on the outlet becomes soapy and full of lube. You can then be sure that the washer is properly lubed and ready for storage. You can do it after every use, or when the winters are harsh. This is going to help you a lot against rusting and freezing. When you’re about to store the pressure washer, make sure the engine is good. These light engines don’t have long live. They only are good for 200 hours. So before storing, empty the engine oil, and replace it with anew Run it with new oil so that every internal engine part gets oiled. When you start using it next season, they come out as new. Always run the pressure washer with fresh gas, and don’t store the washer with some gas in it. Use fuel stabilizers with new gas when you start it up. This will help in the long life of the engine. 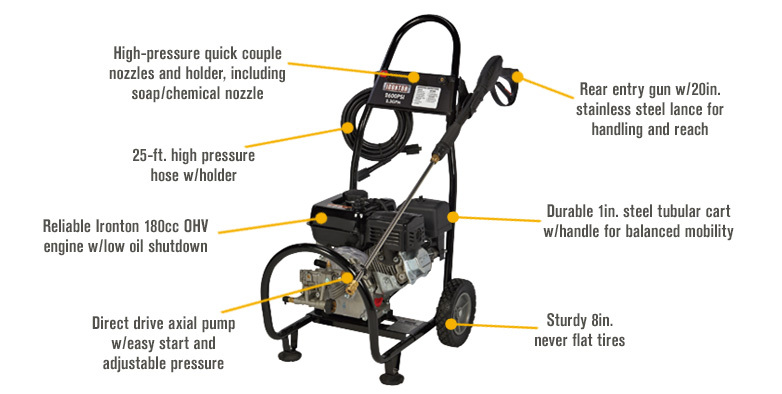 Mostly the pressure washer comes with 25 ft. cord, so if you move farther from the pressure washer, to reach the desired surface, sometimes, you have to move the washer, with frequent shutting down and running it up, the engine wears out. Buy a 50 ft host and extend it, so that you don’t have to move it. Regularly lube the pressure hose connectors, as with constant usage, they can wear out. Use silicon bases lube which is compatible with all the materials used in making the hose connectors. The O-rings are a crucial part, and without them, washing becomes difficult. This will ensure that you have a long life of the hose. Pressure washer parts are delicate and need special care. Don’t use heavy bleaching and cleaning solutions for them. Use solutions which are designed for pressure washers. This includes the chemicals, detergents, oils, lubricants, anti-freeze and various others. Always know which pressure hose is best for the job and how much pressure is required. This will be good for the pressure and hose because each nozzle has a special area of working, if you will use a blaster in the case of spreading nozzle, the pressure washer nozzle will wear out because the same amount of work takes longer with the blaster. Pull the pressure washer trigger first to release the pressure, this will lower the pump resistance and make it easier to start.